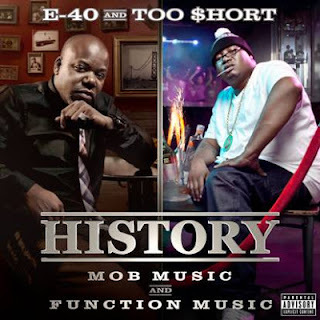 VALLEJO, CA (Nov. 6, 2012) – Hip-Hop trailblazers and West Coast superstars E-40 and Too $hort will release the iconic double disc album “History: Function Music & Mob Music” on Tuesday, Nov. 6 in a historic move that will cement their impact on the world’s music scene. The Ambassador and Godfather of the Bay team up to unleash an explosive combination of new school “Function” meets old school “Mob music” in an ode to Bay Area Hip-Hop. With features including Wiz Khalifa, Tyga, Ice Cube, Sugafree, Jeremih, Travis Porter, Kurupt, Battlecat, Knotch, Cousin Fik, Turf Talk, Dolla Will, Decadez, B-Legit, Stresmatic, T. Nelson, Beeda Weeda and Rankin Scroo, the double disc project can only be described as classic. When asked what it was like working in the studio with fellow Bay Area native Too $hort, E-40 says, “It’s only right. We’re both Hip-Hop legends who have outlasted many artists in the game. That’s my rapping partner; I grew up listening to him. I’m super excited. This has been a long time coming. We’ve been trying to do this album over 10 years and we finally got a chance to do it,” says E-40 about the project. With this project, the iconic duo wants listeners to remember where “Function” and “Mob music” originated – the Bay Area. “It’s hitting so many areas of Hip-Hop. This ain’t never been done before. Just know, we’re game spitters. We did us, we didn’t try to do like everyone else. We got something to say in every song. This is a classic album no matter how you slice it. We’re making it cool to be in your 40s and make music. “We’re making HISTORY,” E-40 concludes. For more up-to-the-minute information on E-40, and Too $hort, follow them on Twitter at www.twitter.com/e40 and www.twitter.com/tooshort.